I'm always looking for ways to make the necessary tasks in life easier... laundry, cleaning, filing, grocery shopping... We all have to do it, unless you happen to have a live-in maid. Since I just went grocery shopping I happen to have one fresh in my mind. 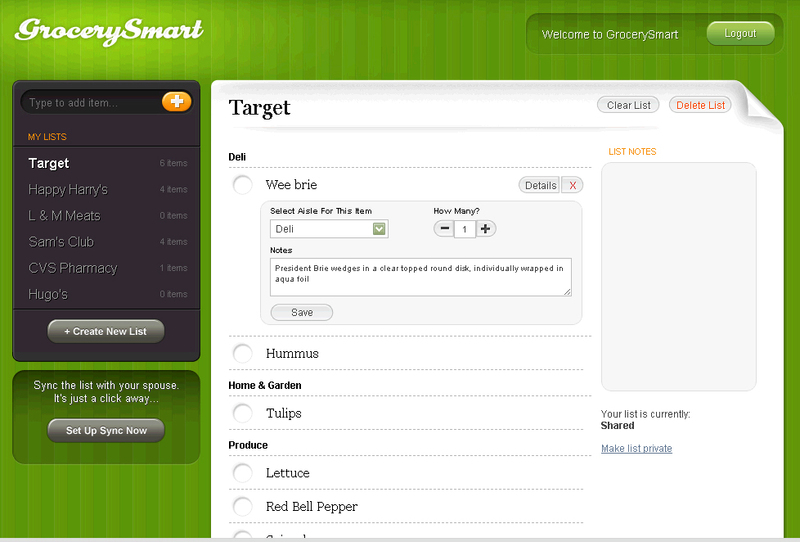 Hubby and I started using a free app for GrocerySmart.net about 4-5 months ago. It's currently available for both Droid and iPhone. The nice thing about the app is if hubby is picking things up for me at the grocery store and I just happen to remember 4 more things I forgot, I can add them from my app or computer and as long as he syncs before leaving the store they show up right in his list. No more calling to add extra items to the list. I maintain 6 lists: Target, Hugo's (grocery store), pharmacy, Sam's club, L & M Meats (our local Butcher) and the liquor store. If we happen to be at or near any of them we can just check the list to see if there is anything we should pick up. We always sync again before getting into the checkout line to see if anything new has been added. There is a spot on each list for notes, so I'll sometimes put what meals I have planned in there and I'll pick up side dish items to go with them based on what is on sale. Also, the app stores your loyalty card information for each store and also has a bar code for the clerk to scan. If you hover over an item and click details, you can add a description which will show up in small font under the item to purchase on the phone app. This definitely helps if you want something very specific and it's not something you purchase often. My list above is pretty empty since we just went grocery shopping two nights ago, but it will give you an idea. On the app itself, you just check off an item as you purchase it. If you are prone to accidentally clicking on items (sensitive phone setting or what have you) I'd just double-check the items marked off before leaving the store (Show All). You can find screenshots of the app interface in the Droid Store. I like it because the interface is uncluttered and easy to use. The only thing that would be a nice addition is the ability to have a personalized master list, that you can add things to your list from. This isn't a huge deal because an auto complete list pops up as you are adding items to your list. I hope someone finds this useful, it's made our lives a lot easier. Also, now we both always have the list with us at all times, so if one of us happens to have extra time to run by the grocery store on the way home we can and don't have to worry about not having the list.